From $0-$30,000 Helping Women Solopreneurs Generate Organic Leads With Social Media. Niche: Helping women solopreneurs generate organic leads with social media. 1. Where Janaina was before joining Consulting Accelerator. 2. How Janaina chose her niche and developed her proof of concept. 3. Who Janaina helps and how she structures her offer to them. 4. The strategy Janaina uses for organic attraction to land clients. 5. Why she tracks everything she does and when she does it. 6. Janaina vision for herself and business in the next 5 years. 7. The most transformative part of the program for Janaina. 8. Insights as to why most people do not sell before they build. Start selling before you have it. Nick Hauser:	Welcome everybody. 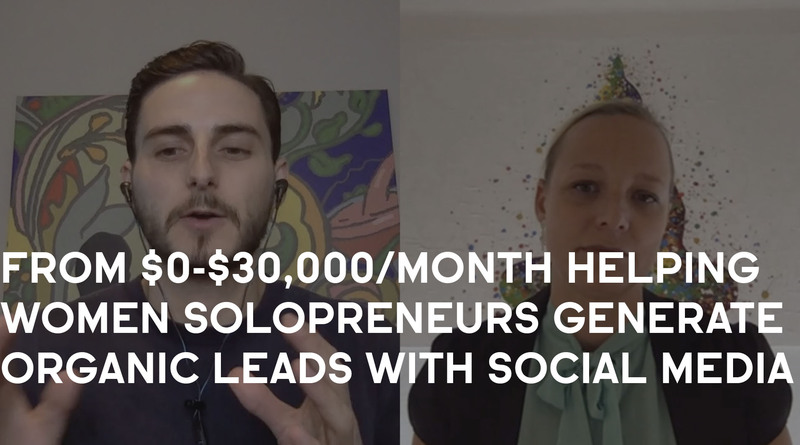 Nick Hauser here and in today's interview I'm going to be sitting down with Janaina Von Moos and she actually started her consulting business 90 days ago from scratch and has grown it to the point now where she's making $30,000 per month. She helps women solo-prenuers generate organic leads with social media. So we're going to jump right in and hear her whole story and how she got started. First off, how are you doing today? Janaina V.:	Yeah, I'm fine thanks. Nick Hauser:	Awesome. Just for clarification too, how do you pronounce your full name and just so everyone else can hear? Janaina V.:	My name is Janaina Von Moos. Nick Hauser:	Janaina Von Moos, okay. Got it. So let's start out, before you joined the Consulting Accelerator Program what was going on with your life? What were you doing? Janaina V.:	Well, I've been independent since I'm 23 and I've been doing several things. Before I was working as a social media manager or a social media consultant for companies, so I was building strategies and concepts for them such as small capitals, international companies. Nick Hauser:	Got it. How long had you been doing that for? Janaina V.:	Social media, well, in my first company when I had a headhunting agency I was using social media to recruit people, so I've been in touch with social media for nine years, but working as a freelancer or consultant, I've been doing that now for two and a half years. But I always had to be on-site of people's business and this is why I wanted to change my business model. Nick Hauser:	Got it. Was there anything else too that contributed to you wanting to actually leave and start your own business other than the kind of location independence? Janaina V.:	No, this was mainly it because I've been independent and working on my own already now 10 years and it was really like changing from this [inaudible 00:01:50] more independent and work from wherever I want to. Nick Hauser:	Got it. So you joined the program. You kind of started kind of a new model and everything. What happened? You signed up for the program. What happened next? Janaina V.:	Well, I had the idea to work independently before, but I was looking for the right program to help me kicking that off the right way, and what happened was very funny. I bought the program. It was this Easter and I just had an accident the day after I bought it and I was knocked out for two months. I got very nervous because I really wanted to consume all the good content that's there and I had strict restrictions from my doctor saying I could not or consume internet, read a book, watch movies because I had to take a break for my brain for what happened. So it took me back two months, but it was very good. I had a lot of time for thinking and really established already for myself what I wanted to do, so the day I started the program two months after, I had already my mindset very clear and just by starting the program, Sam confirmed me that it's really about mindset, so my mindset was in place and I could start right away really implementing like the technical stuff and what needed to done in order to kickoff. Nick Hauser:	So if you didn't have that period where you had that injury and you kind of reshaped your mindset, do you think it would have been as easy and smooth to just progress and take action and everything you needed to do once you started? Janaina V.:	Yes, absolutely because I would just have worked in that with the mindset stuff whish is there, which is a great kickoff how to start a program. I would have been a bit faster I guess in a sense of like really using those six weeks intensively and then kicking off. Although I think it's kind of hard if you're still already having a business or you're full-time employed, it's so much content for six weeks. So I'm not sure whether I would have done it in six weeks, but for sure I would have concluded it a bit faster. Nick Hauser:	Sure. So you came in and I mentioned earlier, but who is your niche and who do you help? Janaina V.:	Yeah. I help solo-prenuers, mainly women to create an online presence so they can generate new leads through social media for their business, mainly organically. I mean, I show them also how to do ads, but I show them how to explore the most out of organic possibilities that are there, some kind of social media guerrilla marketing. Nick Hauser:	How did you pick that niche? Janaina V.:	Yeah, that's kind of funny. I didn't want to work with international companies anymore because of the location thing, and actually people started asking me because I had an online business before for myself in a totally different niche which I build it from scratch too, social media throughout 18 countries. This is running fully automatically and then people asked me, "How are you doing that?" Then I thought actually I could just teach people that. Nick Hauser:	Sure. Where were these people reaching out to you and finding you to really ask for some help? Janaina V.:	They were reaching out through social. They heard of me. They've been coming, I've been doing lots of workshops and public lectures. They're been coming through there or also I would go to a networking even they would say, "Are you not the one that is doing this, that and the other?" We have to mention here, Switzerland is a very, very small place and we have these three languages that we speak or four mainly, and in the German speaking part where I am, like if you do something right, people get to know it very fast. So this was a big point in my cards. Yeah. Nick Hauser:	Got it. Okay, so this was all happening locally or like within your own country. Janaina V.:	It started locally. Now it's spreading out through Germany and Austria also, mainly German speaking people. I picked that niche. I could have done it in English also, but I think I would rather go with my native language and yeah, teach that. Nick Hauser:	Got you. So the niche selection almost happened like organically, no pun intended, that they started coming to you. How did you dive deeper into them and figure out what their true problems were and what you could exactly offer them really to help solve their most painful problem? Janaina V.:	What I actually did is I followed Sam's advice to really have a proof of concept. So I decided for myself to have a small group coaching program until the end of the year, which is still running. I decided to make it very small, maximum of four or five people. I just got four but that's okay, so I could handle them. The strategic decision was to have this group so I can grow with them. From the one side the content that I know that I can teach was already there because this comes from my experience, but I wanted to work very closely to them to understand their pain points before automating or scaling it up and this is [inaudible 00:06:45] was very good. So I really went for this proof of concept, which I'm having now and then I can take it to the next level. Nick Hauser:	Got you. That makes sense. How do you structure that group coaching that's been going on? Janaina V.:	Well, at the moment it has been weekly calls and they have some modules to work through which are already pre-recorded like tutorial videos and also checklists and worksheets and stuff like that, but once a week I check in with them and I really deep dive and hear their questions and then clarify things that are not clear. Those questions are exactly that I'm now using to reshape and refine my service even better. Nick Hauser:	Is there a fixed amount of time that the group coaching lasts for? Janaina V.:	Yeah, it has been for now a three month program, like 12 weeks. It's a bit longer because I wanted to make sure I can really give them the attention and then really see what I have to take out or where I have to deep dive and in the future it will be one shorter and one longer. Nick Hauser:	Got it. The calls you mentioned, is it one call per week, two? Janaina V.:	One call per week. Nick Hauser:	For how long does that last? Janaina V.:	Ninety minutes. Nick Hauser:	Got it. Now, I mentioned it earlier that you help women solo-preneurs get organic leads and monetize them through social media, but how does that actually work from how you deliver the service to them in form of coaching? Like we understand it's videos, coaching calls and such, but what are some of the things that at a high level that they're actually going out and doing that's actually helping them get those results? Janaina V.:	Yeah, I teach them for example, Instagram strategies because for example, in Switzerland Instagram is still being done like a hobby more or less. No one is doing that seriously so I'm teaching them in that Instagram strategies, in that LinkedIn strategies, funnel strategies, how to bring everything together, how to automate, [inaudible 00:08:45] automated nations landing pages and all these things. Like really showing them how they can build their online architecture, but also telling them that they don't have to jump on everything, that they have to select for them what is right for their business, so you have kind of a buffet that you can choose from, but you put the pieces together that goes best for your business. Nick Hauser:	Is there a specific type of like women solo-preneur that you find gravitates more towards the coaching that really benefits from the coaching? Janaina V.:	Yeah, so far I have attracted many coaches and therapists. I don't know why, but it's really people that have a physical business which is running for 10 or 20 years and they now realize hey, come on, there must be another way. Some say an easier way, some just say a new way with new possibilities and they want to understand how they can use that for their business, how they can compliment. Many of them also have the wish to once travel for two months but they're tied to their local business and they are now starting to understand that using different possibilities it could become true for them also. Nick Hauser:	Okay. What are some of the old things that they're doing that's not working that they come to you and they say, "Hey we want to try out these new things." Janaina V.:	Well, the mistake number one that I see is they understand they have to be on Facebook for example, and then they trust an agency or someone or like someone they know that is young and tell them, "Yeah, can you do some Facebook Ads for me," and they spend a couple of hundreds. But [inaudible 00:10:19] the foundation right, these ads will not convert and they get very frustrated because they throw out some hundred dollars and they don't have any conversion. But the conversion cannot happen because there isn't a landing page, there's no homepage and all these kinds of stuff. Nick Hauser:	Got it. So you really give them a thorough proven detailed way to actually go and carry out some of those strategies that they know works, but they don't know exactly how to put it in order. Janaina V.:	Yes. Nick Hauser:	Got it. So you joined the program. These people started reaching out to you and you started some group coaching. How did you go about getting more clients that weren't coming from word of mouth or just coming to you? Janaina V.:	Yeah, so I used some of my old methods when I used to be a headhunter, like outreach has worked fantastically for me. All kind of direct outreach works good. Then I do lots of live calls. I have Facebook Group which I've grown now up to 1,400 members, which I do live once a week, which I share some things, checklists that people can work. I give lots of value for free. People actually started asking me, "Hey Janaina, how do you earn money, you give so much value for free?" But this is my way of trust building and I then just do the numbers game and yeah, I do reverse engineering so I know what I have to do to get those clients. Yeah, like really daily outreach. Like there is no way and there is no excuse to not do my daily business. I really calculated what I have to do per day with this 30 day attack and this after 30 days I have adapted where I have to increase my numbers what is going good so I know exactly my statistics and I've been following this through very consequently. Nick Hauser:	What are some of those older type strategies from your head hunting days that you translate into new age direct outreach organic attraction? Janaina V.:	So before 10 years ago I would do direct outreach for example on LinkedIn or there is a parallel in Germany. It's called Zing. Zing I don't use anymore, but for example on LinkedIn I used to contact people in the normal way. Nowadays everyone does it as a headhunter, but I mixed funnel strategies to generate leads, but also providing them value. So I reached out to targeted people. I provide lots of value. I position myself with my profile with the articles I'm sharing and I very fast try to get them in my funnel by providing value. Once I have them in my funnel I have an exact path where to lead them through and where I want them to land and from there the conversion happens. Nick Hauser:	How do you do that in a way that doesn't come off as like spammy or pushy because I'm sure a lot of people maybe watching this, they get hit up in LinkedIn all the time or Facebook and they're like, "Well, here's another message. I've seen this already." How do you stand out with the way that you kind of do things? Janaina V.:	I think it's the value and we have to mention also that in the Swiss speaking market or German speaking market it is not comparable to the States. Like for example, I would say in Switzerland or also german speaking, all people are doing that on Facebook, but no one is doing it on Instagram or LinkedIn for example. No one is doing direct outreach in other kinds of social media. No one is doing WhatsApp marketing, this kind of stuff. So you still have a possibility to stand out and it's really about the quality. It's really about ... It's not like I would say, "Hi Nick, do you know I'm a social media manager? Can we work together?" It's not the way it goes. It would be, "Hey Nick, I stumbled upon your profile and I see you're doing this stuff and the other. How are you doing with your digital strategy? What are you doing?" Then the conversation starts and there will be three to five messages in between, but what I for example, and this is a tip I can gladly share is for example, if you start talking with me, I say, "Hey, nice to have you here. My welcome gift is A or B. You can choose whatever you prefer. Let me know what you prefer," and then I give you that as a value. That can be an eBook, it can be a webinar, it can be an online training and it has to be of high value and this is how you build trust. Nick Hauser:	Got you. You send an initial message which is kind of more laid back and just ask them an open-ended question essentially. Then once they respond is that when you kind of present that gift offer of, "Hey, I'd love to give you some value. I have A or B. Which would you prefer?" Then after that once they've kind of received that then you message them again like right away or is it the next day? What does that look like? Janaina V.:	No, I give them the value offer they choose from and then I give them that. I always give them more than what they asked for. Some people can also say, "Hey, both sounds very cool. I cannot decide." I said, "Yeah, because you get both then." What I always, I say, "Hey, I would be very interested once you have implemented that, let me know how it's going for you, how it worked out," so they have a reason to come back to me. If they haven't, I time myself, like two weeks after I would follow up, just say, "Hey, I just wanted to quickly know have you already implemented? Have you seen some result because recently I got some feedback that these strategies have been working very well for people that got that gift also so make sure you can start using those strategies to see growth," and stuff like that. Then sometimes they say, "Hey, thanks for reaching out. I've forgotten but yes, it's really working great." So the conversation gets going. Then from there I tell them, "Hey, there is this I don't know, seven email series going or three video series going. Would you like to join? I can give you access to my landing page. The only thing you have to do is sign up so you get it automatically and you can do it whenever it feels right for you when the time is right." This is how you bring the people into the funnel. Nick Hauser:	Got it. Then when those people enter in there, like next do they book a call with you or do you have like a little bit of a quick chat with them to qualify them a bit more? What's like the next step after maybe I received a gift and a work rate from you, I reach back out to you and I say, "Hey, that was awesome." Then you gave me another piece of content, which I entered into your funnel. What happens next? Like how do I actually speak with you and enroll? Janaina V.:	Yeah, so after this conversation phase I try to get them early into the Facebook Group. This is for me at the moment the core thing. I wanted to change that in the future because it's not so reliable anymore, but for now this is my core piece. I put them in the group because there is already community that is interacting. I go in once a week live and mainly I give them opportunity to make the steps towards me when they feel right. The call to action after each video is hey, if you want to deep dive, if you want to work with me closely, book your free call and then I get them on the call. Nick Hauser:	Got it. That was the next piece I wanted to slide over to is the Facebook Group. How long have you have that? You said 2,400 hundred members? Janaina V.:	No, 1,400. Nick Hauser:	One thousand four hundred. How long have you had that group running? Janaina V.:	Nine weeks. Nick Hauser:	Nine weeks? How did you get 1,400 people in there in nine weeks? Janaina V.:	Some of them because they already knew me from previous collaborations or just my name. I've built up my brand in a sense before as a headhunter so people know me. They know if I do something it has something to it. It's not just hot. So I started on my personal profile saying, "Hey, I've got this group running. If you want some free content, how to optimize your social media, you should join. I will be throwing free value." So people started to come and I gave lots of value in the first week I went live like every day and said, "Hey, you know, there's a big thing coming. Make sure you invite your besties to profit from that also because I don't know how long I will be able to maintain that rhythm, but things are going." So they started inviting people and they always invited their best ones like their best friend or the brother or something like that. This is how I grew it very fast. I was not growing it through ads because exactly I wanted to show my coaches that it is possible to grow a group so fast without having ads for it, which at the moment is anyways difficult. Facebook doesn't like to see ad, Facebook Groups to be promoted so much. Nick Hauser:	So it seems like you made that initial post and you really took advantage of the network effects of the other existing members in the group going and finding people they thought could benefit from it. Janaina V.:	Yeah. Nick Hauser:	Do you think that happened because you had those great pieces of content maybe back to back to back in the beginning stages of those Facebook Lives, that people did come in and they said, "Hey, this is a good group. Let me go refer my friend." Or was it something that you posted, the way you worded it that really encouraged people to go reach out to their friends? How did you really click the start button on extending out like those network effects? Janaina V.:	I think first was providing value, showing them that I know what I'm talking about and that they can really benefit. Like my goal is from every video, from every live that I do they have something, at least two or three tips that they can implement right away. That they can go, do it and see results. Once they see results they are very likely to share it with their besties. The only thing you have to do is the right call to action. Tell them, "Hey, you are actually allowed to invite people," because here they sometimes think oh, that's very private. I cannot allow it. I say, "No, you're allowed. Get your friends if they can benefit from that also." But you have to make sure that they get a piece of content that they see results right away. Nick Hauser:	Got it. Okay. Now you've structured it too where it's been group coaching to this point and you said you were thinking about transitioning maybe not so much into the Facebook Group and maybe scaling to that a different way, with like an online program. What are you thinking about moving forward how to really take this proof of concept you developed in these last 90 days and really take things to the next level? Janaina V.:	Yeah, definitely a group, an online program which is fully automated. So the next will start in January. It's the last time I of it but with a bigger group. I want to have [inaudible 00:20:19] people so I can still coach [inaudible 00:20:21] and in the meantime I will finish all the content and all the online architecture that has to be there, which is tons of work. In the meantime, I hired like six or seven freelancers to help me with that, so it's not a one woman show anymore. But that's cool. Like I would say latest from March it should be fully automated. Then I can just concentrate on generating more leads to put myself out there, but the rest will be fully automated. Nick Hauser:	Got you. You mentioned a couple times too that it really seemed like you had your numbers tracked organically. You know, if you've been part of the training, like definitely when you're putting money into the machine of like Facebook or you're running any kind of paid traffic it's very important to track. A lot of people don't talk about tracking organic to figure out how many of X, how many posts or lives do I need to do to generate ultimately a new client. So how did you really think about that kind of stuff when figuring out how to optimize everything that you were doing organically? Janaina V.:	You have to track everything. Also the actions, you have to track how many people you reach out to for example on Facebook, how many people you reach out on Instagram. What is the conversion rate? Where do people really come from? Which people are most likely to buy? So you can really decide on which channel you spend the most time because time is also currency, right? You have to track it. It doesn't matter if it's paid ads or if it's your time that you're putting in. You have to track it exactly the same way. You have to know what you're doing and what the result is out of it. Nick Hauser:	So where do you track these kinds of things? Janaina V.:	Where do I track it? Nick Hauser:	Yeah. Is it like in an Excel document or do you have a notebook? Janaina V.:	For now it is in an Excel document, but also that will be optimized, but for now it's in Excel. Yeah. Nick Hauser:	Do you get pretty specific on your different things like you said your time, but do you also specifically track what you're doing in the Facebook Group, what you're specifically doing on Instagram or just as a whole? Janaina V.:	No, no, I track what I do where. For example, I track okay, I reached out to 10 people on Instagram. That day how many came in, so I know for example that on Sunday more people are likely to join my group than on Monday for example. Then you can really track your activities and if I do the exact same thing on Facebook, the same reach out that Instagram is converting three times better than Facebook for example. All these things I know and I have in place in order to optimize because there will be a time when I can also say okay, mainly my people are coming from these two channels. I can disregard the third channel or just do it automatically with ads but not organically anymore. So in order to make those decisions you need to have your numbers in place. Nick Hauser:	When do you track them? So you're taking action on this every single day on these different platforms. Are you tracking it like as you do it, later that night, the next morning on yesterday's data? Can you explain that a little bit? Janaina V.:	Yes. I normally do it 24 hours after in hindsight. Nick Hauser:	Got you. Janaina V.:	Because you need some time reaction, because for example I also found out that people that are on a daily basis on social media, they are more likely to join my group. Even if they join like five days later they are not the same quality lead as the people that joined within 24 hours because they're not so often on social. They don't consume my stuff so regularly and therefore they're less likely to buy than the people that are on a daily basis and consume social on a daily basis. They are more likely to invest in their own social presence and stuff. Nick Hauser:	How do you distinguish like the five day, the person who joined five days later or 24 hours if all of your other members are adding them? Like if it's not you who's manually adding people, how do you know when they're coming in a day later or five days later? Janaina V.:	I check the things that are coming through myself. What people are referring I cannot track it. Nick Hauser:	So you're also doing a bit of manual additions to that group then it sounds like. Janaina V.:	No, but if I do a normal reach out or I find someone and say, "Hey, you're doing this, that and the other. It sounds interesting to me. How is it going," and we start that conversation, then I invite them at a certain point to my Facebook Group. This is then what I do manually myself. Nick Hauser:	Got it. So you start out with that same kind of laid back, poll style, direct outreach measures and then if it seems like a good fit then you invite them. You're not going to just spam messaging people ... Janaina V.:	No. Nick Hauser:	... to say, "Hey, join my group." Janaina V.:	[inaudible 00:24:42] blocked a long time ago if I would do so. Nick Hauser:	Got you. So what's the five year vision here? Five, 10 year vision even? Longterm, what are you really looking to do with this business you're creating? Janaina V.:	Well, that's a good question. I want to scale it up. Seven figures is the big goal for 2020. That's where I'm wanting to go so that I can really work fully location independent. I am somehow location independent, but I still like to use some offline networking for now. It has been working very good for me so I want to become fully location independent, seven figures, and then I want to start diversifying with other kinds of projects and services. Nick Hauser:	Got it. What do you mean by diversify into different projects and services? Janaina V.:	I want to build up some other streams of income, but at the moment I cannot tell you what this will come along the way, but complimentary services that I could offer. For example, I could build a social media agency with freelancers doing that, but I don't know if I'm going to do that, but this would be an example. Nick Hauser:	Got it. Oh, so you mean an extension of kind of some of the things you're doing versus like completely a new ... Janaina V.:	Yeah, it doesn't have to be something completely different. It could also be that if I have the money I will start investing in, I don't know, startups for example. Nick Hauser:	Got it. So you're leaving it on the table. That's fine. Janaina V.:	Mm-hmm (affirmative). Nick Hauser:	I said you're leaving it on the table to be figured out at a later date. That's cool. Janaina V.:	Yeah. First I need to generate the money. Once I have it I would have lots of ideas what to do and I'm for sure, I totally believe that I will also meet the right people on the way to come up with such ideas. Nick Hauser:	Yup, that makes sense. What has been the most transformative part of the Accelerator Program for you? Janaina V.:	Oh, there was so many things, so many things, but I think to really do this number crunching, this was something I've been in business for a long time, but I neglected it a bit I have to say. I haven't been so precisely on that and since I know my numbers by the comma and by really precisely by the cent, I would say this has transformed it the most. Nick Hauser:	Got it. Yeah. That's really good. You've seen other members as well. What will be your number one piece of advice for them? Janaina V.:	Start selling before you have it. Nick Hauser:	Why do you say that? Janaina V.:	I say that because the first time I did my online program I spent so much time of putting a program together, which I believe was good, which I created mainly in my head and I spent lots of time and effort in that, and it wasn't going so well as I expected, and this time I turned it around. I sold the coaching program which I didn't have. I just was like two, actually I'm two weeks advanced my coaches but I have enough time to prepare and I can adapt. Yeah, I made the turnover and I could use that money to invest and do a good program before just creating something in my head. I have had this advice like seven years ago from another coach and I never used it, and since I'm using it it's working fine. On the way I've been throwing out some other services and products which has been sold automatically online or little bits and pieces are not high value or premium coaching stuff, but I just put them together very fast and I sold them before I had them and it already generated some income, so that's cool. Nick Hauser:	You said you even got that same advice kind of seven years ago. It is a common trend for a lot of people, they try to make everything in their head and then try to go and sell it and then they take people on. They may realize like this wasn't the actual thing they wanted. Why do you think a lot of people initially start there? Their kind of instinct is to let me just all make it in my head first before going to talk to anybody. Janaina V.:	I think it has to be a bit with insecurity in a sense. You think the longer you work out the topic or you work with that topic, you become more of an expert and you need to be an expert first or to somehow earn that status before you can sell it, and it has nothing to do with that. But it can also be that we have been taught that way in a sense, that you have to invest 10 ... Many times you hear you have to invest 10,000 hours into a topic until you can call yourself an expert. Yeah, I think it comes a bit from this kind of belief and mindset. Nick Hauser:	Yeah, that's good advice and kind of what you shared as to what you probably should be doing because it's more effective and it helps you gain more skills and be more effective, put out good content and actually help your existing clients get results. Awesome. So to wrap up here too, where can people find more about you online? Janaina V.:	They can Google me out or they can just check me out on my socials. I'm always working with my name, so Janaina Von Moos, they can find me. Nick Hauser:	Got you. What about that Facebook Group that you have too that they can get some content as well? Janaina V.:	Yeah, the thing is it's in German so the German speakers are very welcome. The English speakers, they will be struggling, but actually we have a great German speaking consulting group and we have been helping each other very much. This is a very cool community that we've built also. Nick Hauser:	Got you. So for any German speakers out there, what's the name of that group if they want to search that out? Janaina V.:	It's Janaina Social Media [inaudible 00:30:05]. Nick Hauser:	Okay, so if you're a German speaker you'll probably know what she just said. Anybody else, you probably can't find the group. Janaina V.:	No, it's just Janaina for like small entrepreneurs. Nick Hauser:	I got it. okay. Awesome. Yeah, well it was great speaking with you and hearing your story and just 90 days going from zero really with this new model to 30K. It's great proof to see that you've taken the time to follow the training and sell before you build and be patient with building out the proof of concept and really working closely with the clients in the initial stages to make a really large transformation longterm, so that's really great to see. Because you experienced that injury and then you still stuck with it, I think it's a really great inspiration for everyone watching here that never give up and there are no excuses because you still, if you're committed and you have the motivation to it, you absolutely can. So really appreciate your time today and sharing with us exactly what you're doing, what you're looking to do, and look forward to seeing your results coming here in 2019. Janaina V.:	Thank you very much for having me. It was a great pleasure. Nick Hauser:	Awesome. See you later. Janaina V.:	Bye. Nick Hauser:	Bye.